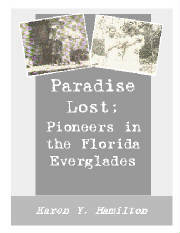 Paradise Lost: Pioneers of the Florida Everglades by Karen Hamilton Silvestri- A compilation of historical texts, memoirs, and photographs of the Hamilton Family. They were the black sheep and they were rough – but then life in the islands was rough. Records indicate that the Hamilton clan lived in the Ten Thousand Islands as early as 1870. They were often left off of national censuses and were ignored by the other settlers of the Islands. But the Hamilton’s were an essential part of South Florida history. They belonged to the truly original pioneers of the wild and untamed land called Florida. Before the railroad, before the rich descended on the tropic beauty, the true pioneers were the desperate, the poor, and the runaway slave, that sea of humanity who was looking for a place to hide. And they found it – deep in the insect, gator-ridden swamp, where only the truly desperate ventured in an attempt to disappear from society.